A nonlinear programming model is developed for analyzing the queuing model of a kanban controlled system with fork/join synchronization stations. The model finds the minimum number of kanbans for a given throughput requirement or the maximum throughput for a given number of kanbans, where servers have different exponential service times. Furthermore, it aids understanding of kanban systems. This proceeding is published as Kim, Heedong, and Sarah M. Ryan. 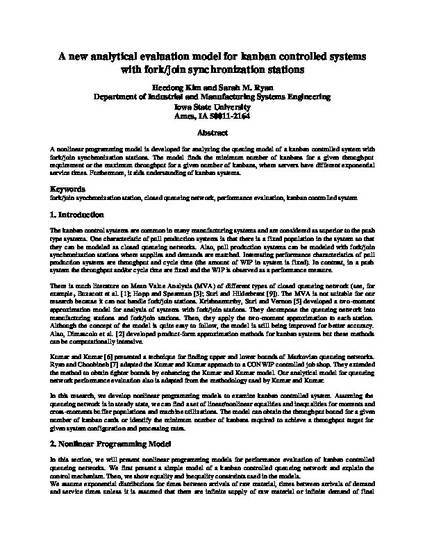 "A New Analytical Evaluation Model for Kanban Controlled Systems with Fork/Join Synchronization Stations." In Proceedings of the 2002 IIE Annual Conference and Exhibition. May 19-22, 2002, Orlando, Florida. Posted with permission.